The co-operation between the European Environment Agency (EEA) in Copenhagen and the United Nations Environment Programme (UNEP) is being expanded and extended. 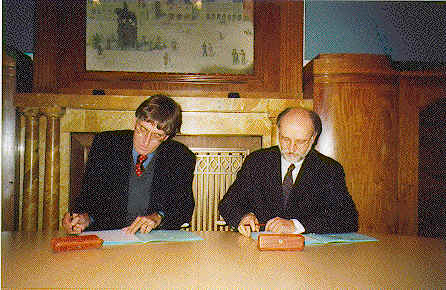 A new Memorandum of Understanding was signed on Thursday 23 October 1997 between the Executive Director of the European Environment Agency, Domingo Jiménez-Beltrán, and Regional Representative and Director of UNEP’s Regional Office for Europe, Frits Schlingemann. The meeting between the two Directors was held in Copenhagen, Denmark. EEA and UNEP have already been co-operating for some time, in order to develop mutually supportive activities. The new Memorandum of Understanding between the two organisations provides new possibilities for a deeper and closer relationship. The background of the new situation between EEA and UNEP can first of all be found in the fact that the two organisations already have mutually complementary activities, goals and requirements to satisfy, but each has restricted means with which to achieve them. An example from the capacity-building and networking side is the complementarity between UNEP’s ENRIN (Environmental and Natural Resources Information Networking) and EEA’s EIONET (Environment Information and Observation Network). While the EEA’s main focus is on EU and Accession Countries, UNEP has global strengths and thus is able to cover complementary areas around the periphery of Western Europe, in both Central and Eastern Europe and in the Mediterranean Region. Together it is possible to build a wider and stronger network. There are many goals of this co-operation. In the context of the "Environment for Europe" process and in particular, the next major European Ministerial Conference on the Environment to take place in Aarhus, Denmark in June 1998, the EEA’s and UNEP’s mutual activities should improve the efficiency of both organisations and provide an improved information base. For example, the cooperation is facilitating the development of the new progress report on the state of the pan-European environment (Dobris+3) to be ready early in 1998, as a follow-up to the first Dobris Assessment published in 1995, as well as input from this process in the preparation of UNEP’s second Global Environmental Outlook (GEO-2). The groundwork being laid for a joint reporting activity on the Mediterranean area will also benefit from this deeper co-operation. Fundamental to all these activities is the use of existing capacities, the catalysis and mobilisation of additional resources, and the complementarily of both agencies’ networks. A major objective is also to improve access to environmental information, for countries with economies in transition and in the greater Mediterranean region as well as decision-makers civil society and the European public in general. In this context EEA and UNEP will support the strengthening of capacities of countries to manage and exchange information on the environment (especially the technical base needed to support data gathering and dissemination) to produce state of environment reports and assessments. This cooperation will benefit all the European partners of the two organisations. It will also enable EEA and UNEP to work more closely with the European Commission’s PHARE, TACIS and MEDA programmes. "Our co-operation, however, is not new. Joint ventures have already been carried out including assessment of critical issues", informs EEA’s Executive Director, Domingo Jiménez-Beltrán. He refers in particular to a joint statement produced on water resources and pollution in the beginning of 1997 and a next statement on chemicals which is under preparation. Both directors agree that drinking water and chemical pollution are a major concern for the population in Europe. It is essential to have as much information as possible about the presence of chemicals such as pesticides in groundwater and in the food chain. "Doing things together will help us do them better and more efficiently, as we are already doing with the WHO Regional Office here in Copenhagen. This is real ‘networking’ ", says Domingo Jiménez-Beltrán. For references, please go to https://www.eea.europa.eu/media/newsreleases/dec_make.html or scan the QR code.